Good morning - It's time for another Sweet Sunday Sketch Challenge! Here is the deal: make a card with this layout and use the InLinkz button down at the very end of this post to enter your card. The links will close on Friday at 10 PM (Mountain Time), and I'll randomly select one card to feature on my blog on Saturday. So, as long as your card is linked by 10 PM Friday, your card will be in the drawing. Be sure to link directly to the blog post or gallery image which features your card. You may post a picture of the sketch on your blog, but please save the image to your computer first. 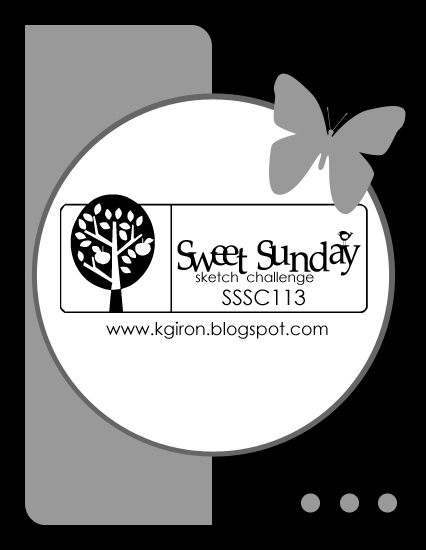 Use the keyword SSSC113 if you plan to post your card in an online gallery. I really had a blast with this sketch and love to play with different items to have peeking over the circle panel. Today I chose to string balloons from the buttons to the top of the card - pretty fun! 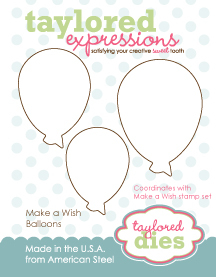 I picked up some Life of the Party paper by Basic Grey and matched it with Make a Wish from Taylored Expressions. The cake is stamped in Memento Tuxedo Black and colored in with Copics and then I cut it out and popped it up with dimensional tape. The balloons are cut out with the Make a Wish Balloons dies. Another great sketch Karen, thanks for the inspiration! Oh that's fun! Love your balloons! I LOVE this sketch Karen!!! And I REALLY LOVE how you strung the balloons to the buttons!!! Super, super cute Karen, love those balloons, held by the buttons!! Love the fun colors too!! I like how the balloons are held down by buttons! Super cute birthday card Karen! I love all the patterns and fun balloons! I LOVE how the balloons look like they've been threaded through that button!! Clever!!! Karen love you card great idea attaching the ballons to the buttons. This is so cute - the balloons and the buttons are simply brilliant!! Love the balloons! Such a cute card! Great sketch this week - I wound up making four cards! LOVE!!!... This is SO cute!! And you are most definately the QUEEN of all things DSP!!! AMAZING!! Wonderful sketch - again! Love your card. love your sketch and card, Karen! Thank you for some great inspirations - loved playing along! great sketch. I like to participate when I can. Unfortunately i didn't get a chance to link in time.